Grocery Gadget aims to make your weekly trips to the supermarket more organized. The key innovation in the most recent major overhaul to this shopping list manager from Flixoft is recognizing that the bulk of each shopping list remains largely unchanged from week to week. 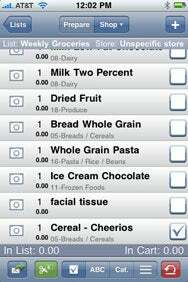 Thus, instead of forcing you to scrawl milk, eggs, and Golden Grahams on your list time and again, the iPhone app lets you create and maintain one or more “master” shopping lists, which you can tweak as needed on subsequent grocery visits. Lists of Features: Flixoft has packed a number of features into Grocery Gadget, including the ability to create and maintain master shopping lists, coupon integration, and more. Tapping on any one of those lists shows you its contents, which you can view on either the Prepare tab (where you tweak the list as needed before hitting the store) or the Shop tab (once you’re pushing your cart around). Again, as noted in our review of the first version of the app, Grocery Gadget’s impressively massive database of supermarket items vacillates between helpful and frustrating: when you try to add a staple like, say, “milk,” you need to scroll through antacid (milk of magnesia), coconut milk, condensed milk, evaporated milk, and the ilk. When you’re just searching for fat-free milk, that’s a pain—especially since you don’t know whether the app lists it as “skim” or “non-fat” instead. Toggling the “add item” screen so that it’s sorted by category (instead of the default alphabetical presentation) makes this a lot easier, since you can quickly scroll to the dairy section after you type your search. Still, if the app supported more than exact match searching—that is, if searching for “milk fat” found “non-fat milk”), that would improve list creation tremendously. Once your list is assembled, though, Grocery Gadget really shines. You can view your custom list in the order you added foods to it, alphabetically, or by category. If you’re my wife (or someone like her), you can choose to reorder your list manually, so that it’s organized for maximum shopping aisle efficiency. If you’re more like me, and are always a bit surprised when you rediscover that aisle 17 is where the sodas are kept, the by-category list works pretty well—you just scroll to the “beverages” section when you realize that’s where you’re standing. Speaking of me and my wife: on occasion, if she needs a specialty or unusual item, I may end up flustered at the store—or worse, I’ll bring home the wrong thing. Since Grocery Gadget lets me snap a photo for every item on my list, I can vastly reduce the odds of my purchasing the wrong hair products for my wife, and spend far less time staring confusedly at the selection. Win-win! Checking items off your list is simple, and you can double-tap to indicate that you don’t need specific items on this shopping trip. If you take the time to add in prices for all your groceries, the app can keep track of how much your list (or cart) should cost—even optionally tracking sales tax as needed. In a marked improvement over previous versions of the app, Grocery Gadget now makes it a snap to e-mail copies of your shopping list. Other niceties include options to add items to your list by scanning their barcodes, importing grocery items from other shopping and recipe apps, and synchronizing your shopping list across multiple devices. The app’s new integration with Cellfire lets you browse coupons for your local supermarkets, and you can save the coupons to your club card for the store; when the cashier rings you up and scans your club card, your saved coupons are automatically applied. It’s pretty cool, and works a bit like magic. I was skeptical when I first tried out Grocery Gadget. But in spite of a few usability challenges, the app has unquestionably improved my grocery shopping experience—most significantly by speeding up the entire process.